Wheelchair Exercises - Get Up and Get Out! Your guide to stretching and strengthening your way to independence. Simple guidelines, stretches and exercises - endless possibilities! Wheelchair exercises? You already have what you need!. Wheelchair Freedom gives you the tools, tips and tricks you need to move to the next level of fitness no matter how long you have been in your wheelchair. No special equipment - just you and your chair! Now just add our 74 page e-book, assistance from family and friends and motivation to add more strength, vitality and independence to your life. Wheelchair life can keep you indoors, weaken muscles, change your posture and cramp breathing and digestion. Wheelchair life in short can make you sicker than you already were in the first place! Coaching your through your wheelchair exercises is at your fingertips - right here - right now. 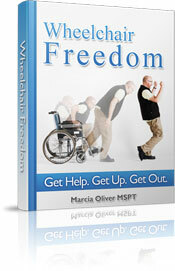 Our new 70+ page e-book, Wheelchair Freedom! Get help. Get up. Get out. teaches you how to safely, easily and effectively master those wheelchair exercises needed to gain functional strength for legs, chest and back to help you get back on your feet again. Take the next step today - tomorrow never comes, learn what you need to do to become strong enough to walk again*, or get in and out of your car (any many extras) our E-book will get your started. When it comes to wheelchair exercises, all you need is my extensive, illustrated resource, - you've got nothing to lose and everything to gain - if not the ability to walk, improved health, strength and mobility! Many patients sleep in a bed in the living room because they can't get through the door of their bedroom. Find out if that is permanent! If your chair-cation has lasted longer than you thought. 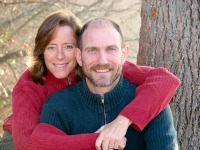 If you feel your life ebbing away and know you could walk again with a little motivation and a lot of know-how. If you shut inside because it's just too hard to get in and out of the car. Think twice - this e-book is loaded with all the information that I successfully taught my patients over the years! If they can reach their goals, you can too! Your purchase is totally risk free to try! Nothing to lose, yet health, strength, vitality, mobility and greater independence to gain!. You have instant access to your purchase! You could be planning your home program or your next outing today! One Time Payment of $30.00! That's less than one co-pay to your doctor! You will need Adobe Acrobat Reader to view your PDF file. If you don't have this installed on your computer, then you can download it for free, from the here. * (The information on this site does not always apply to everyone - results may vary).